Julie, the photographs you took of Brighty are the best ones I have! 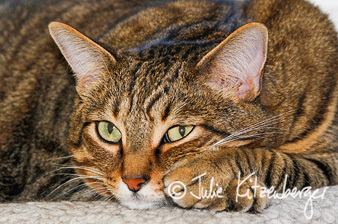 Julie, the photos of Ginger and Velcro make me smile every time I look at them! Oh, Julie, they are superb! Julie, you have captured my Zoey Cat’s elegance! She looks very much like she is on a magazine cover! I cannot thank you enough for the beautiful pictures of my foster kitties, Valentine and Scout. You captured their beauty and sweetness perfectly! I follow my foster kitties’ progress until they go to their permanent homes, so seeing them captured so lovingly by your eye and camera really makes me happy. It was such a pleasure having you capture these precious images!! Snowball has already grown since then, so these will be even more precious when he gets older. We’ll have to do another session! Hi, Julie. Just wanted to say thank you for the pics. I absolutely could not have been happier. They turned out awesome! 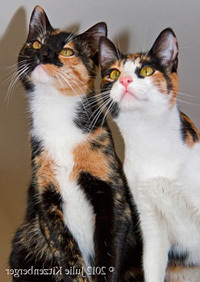 Great images of Poes and Nemo — you captured their personality and playfulness! I am so happy we were able to coordinate your taking the pics at our house while we were on holiday. It was so fun to find out what they were doing while we were not there!! I found Julie an excellent photographer of cats. She captured the personality of mine in an exact and complimentary way. I was more than pleased with all of the photos of my cats.